Just a quick post to talk about UX (User eXperience). Do you still think that UX is only software-related? Do you still think UX is only usability and/or design? UX is all about what the user feels when he is using some product or service. I took this photo at some drugstore, in New York. 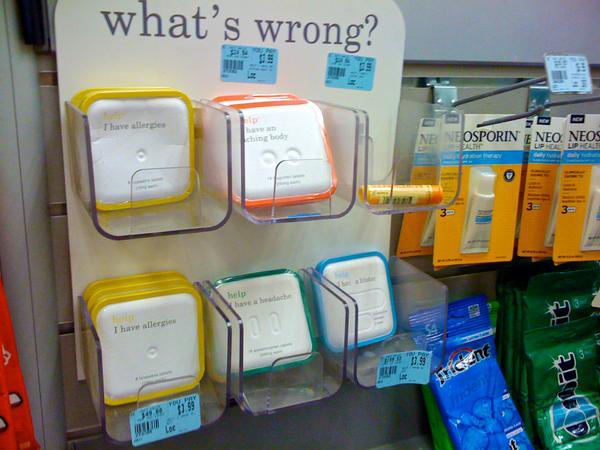 Think about what the user (or customer) would feel when he has some problem, and he needs some medication, but doesn't want to think or remember complex medication names. I know that, in this particular case, there may be some problems like allergies or just hiding the real problem, instead of solving it. But I still think it's a great idea, great design and it probably has some advices at the back, informing the medicine name and precautions. I'm a software craftsman and product developer from São Paulo, Brazil, who loves beautiful design, user experience (#UX) and solving hard problems.